Most knives are available with all handle options. Specific models come with either insulated wood handles, plastic handles, or plastic handle with a cushion grip. Red cushion grip is standard. Other colors (blue, green, or yellow) are available. The cushion grip provides a softer, more ergonomic grip. 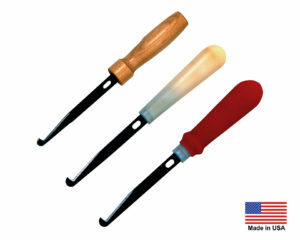 Plastic handles are more heat resistant than wood handles and last longer when used with Everhard knife heaters. To see our complete line of products in this category, go to Customer Login and enter your customer # and password. Current customers can click here to get a password. If you are not currently an Everhard customer and would like a temporary password to view individual products, model #'s, and options, please call 1-800-298-2832. Please login to see a complete listing of available products.